A few months ago, when the idea of reading Ursula K. Le Guin's Earthsea cycle seemed distant and unrealistic, I came across a colleague reading the books. Flipping through a few pages, I noted the fairytale-like writing - it felt like Le Guin was sitting next to me and telling me a story in the most simple and straight-forward fashion. At the time, I concluded that the Earthsea books must be the kind that were best read in childhood. Despite loving Le Guin's writing and wondrous imagination, I felt that I had missed my opportunity. 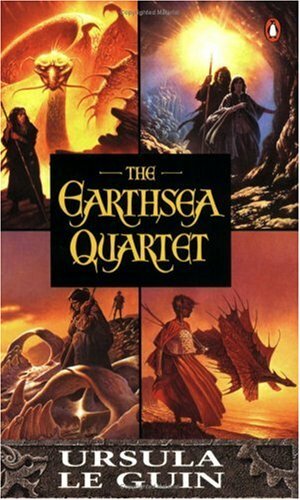 This past Thursday, an old, clearly read copy of the Earthsea Quartet (the first four books, through Tehanu) was given to me as a stepping stone into the wider world of fantasy. On Friday I began to read, and by Saturday afternoon, I had completed the first two books and was ready to start the third. The weird and wonderful thing about this specific edition of the Earthsea books is that it's a compilation. Normally, I dislike reading sequels one after the other (to avoid the stories blending), but with the Earthsea books, the time periods jump so drastically between books that there was no problem. I finished A Wizard of Earthsea, ate lunch, and immediately began to read The Tombs of Atuan. A few hours later I was done... and itching to read more. My original assessment stands - I probably would have loved the Earthsea books as a kid. And yet even now as a relatively young adult, I'm completely into the story, appreciative of the characters, and enthralled by Le Guin's method of presenting it. I'm eager to find out what happens, excited and entertained. Yes, there's something childish, or child-geared to the writing, but this doesn't detract from my adult-mind appreciation. It's just good storytelling. I don't know much about these books, but I have long herd them touted as great reads. It sounds like you had a really good time with them, and you've inspired me to dig a little deeper. Thanks for the very enticing and enthusiastic review! She's amazing- I think Le Guin could write a grocery list and I'd pay to read it. Unlike many series, I found that I loved the later books in this one even more than the earlier ones. And, yet, what I DO love about the earlier ones, is the woodcut illustrations. I'm guessing that your copy doesn't have them (and neither do my childhood volumes in the series, which are just yellowed pocketbooks), but when I re-read the series a few years ago, I borrowed the originals from the library to have the artwork alongside, and it was wonderful. Lovely to hear about your discovery: you've made me want to re-read again.